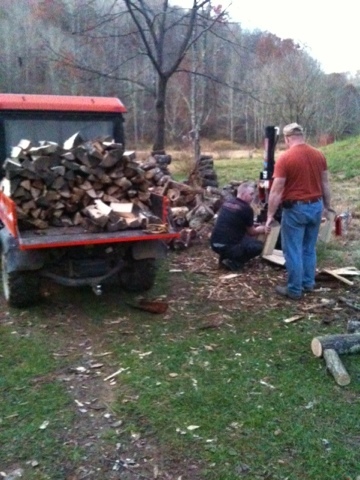 We spent most of Saturday getting Firewood stocked up for the winter. Over the summer we had cut up about 4 cords but have been waiting for cooler weather before we went into full split mode. Last week Linda and I went over to Johns to pick up my log splitter. It had been hauled up the mountain last February when we ran short on wood and needed an emergency load. No worries, it was tarped up and well protected. We headed up the steep path on the backside of John and Carol’s property… that is until we came upon that oak tree that had fell across the trail. Lucky for us we had the chain saw with us and we made quick work of it and continued to the ridge-top. More bad news, after un-tarping the splitter the first thing I saw was that it had a flat tire. I managed to lift the axel up enough for Linda to wedge a log under it and pulled the rim off. We hauled it back down and worked on it. After about an hour we just couldn’t get the tire to seal on the rim. We uses a ratchet strap, dish soap but must not have been holding our tongue just right. The next day I picked up a tube and wrapped up that task. Last Saturday, Harold and I got the splitter back home. Linda and Clarissa even helped us out. 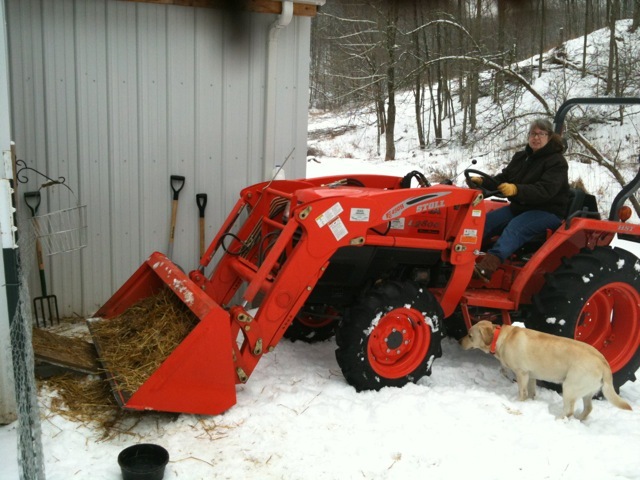 Harold and I cut up a couple trees that went down in a farmers field near our place and the girls loaded the Kubota RTV. We spent the rest of the afternoon splitting and stacking. We have put up about 4 cords so far and have about 2 more to split Later we required a few aspirin for the pain. We had been using a small underpowered 3500kw Champion generator as the backup generator for the last two years. We always had plans to replace it with a bigger one but just never got around to it until this weekend. 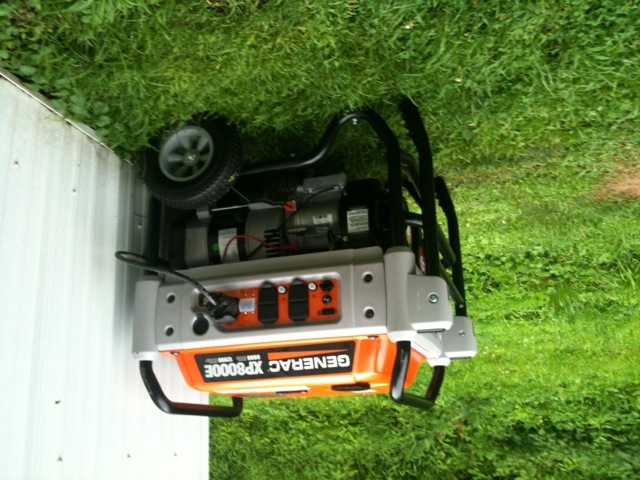 The Primary generator is a 8kw propane Guardian and it takes care of all our charging needs for those long dark rainy weeks. You see, nothing is the same living out in the boonies and living off the power grid. We have solar panels for electricity, a primary generator but also a backup generator. Everything has to have a Plan-B to go with it. Our heat is from out wood stove but we also have propane backup. We have 4 wheel drive cars, and a backup 4 wheel drive tractor just in case the snow is too much. We have lights but have oil lanterns, Gas stove to cook on but we can also cook on the wood stove. We have Internet, Satellite TV and Satellite radio to know the weather. We even have multiple stove-top coffee peculators. We even have a great refrigerator but we still built a root cellar. It is just our way out here. And to be honest, continue to learn lessons every day on PHF. April showers bring May flowers but they also make it difficult to get caught up on outdoor jobs. All weekend we have been dodging rain drops while attempting to catch up on some projects. Of course Friday was the usual trip to town to give Lowes and Tractor Supply their weekly cut of our paycheck. Throughout the week I make a list of things we need to pick up and am usually jotting down add ons while Sonny steers Festus down the highway. That old truck has carried so many loads from those two stores that it should be able to drive us there all by itself. Friday afternoon we took a ride on the four wheeler up the back hills of our property. The four wheeler has been a life saver…literally… It has saved us from huffing and puffing and whining every step up the hillsides. We aren’t as young as we used to be. For two years we have wanted to clear away some of the trees that the logger let fall across the paths. 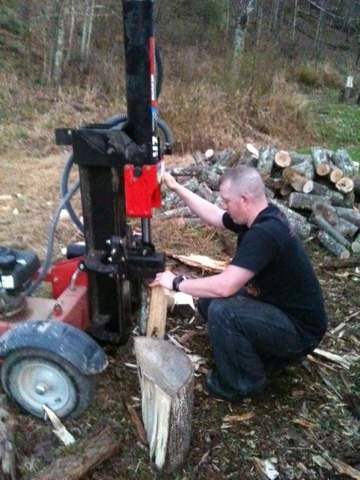 Sonny was on a roll using the chainsaw to cut up the fallen trees like a seasoned lumber jack. 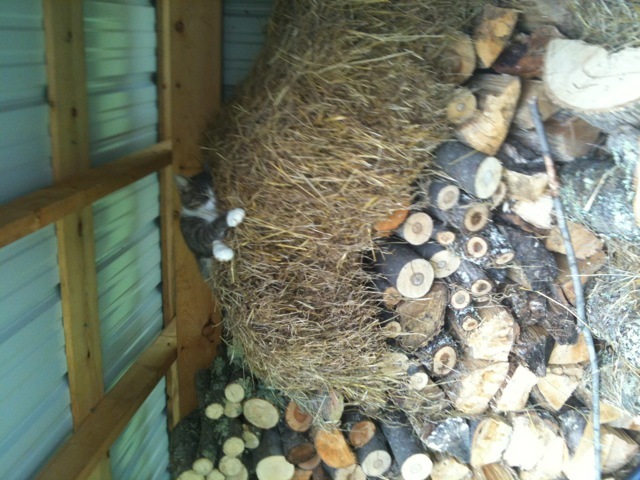 It was a good thing I ate a big breakfast because I expected to roll the logs off the side. We were making excellent headway until the chain came off the bar. Of course all the tools were back at the house. We were able to clear a good portion and some of the logs, most were so rotten so we were able to just break them apart. Just because the chain saw was out of commission didn’t mean our work was done. We walked the steep property line and put new ribbons on the trees to mark our boundaries. We actually enjoyed working up there and it was nice to see the buds starting to show on the trees, especially the red bud trees. 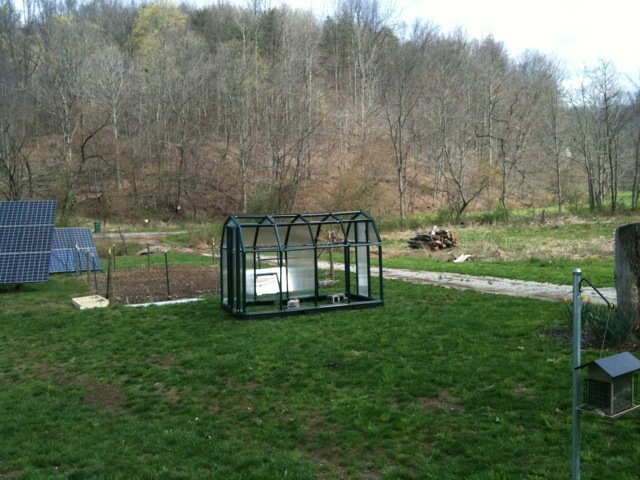 The greenhouse is on the mend and moved back to its original location. Sonny and I used ropes wrapped around the base on each end like a handle. We then lifted it, taking shuffling baby steps as we turned it completely around and settled it into place next the garden. Back in place and looking better. Sonny replaced some of the broken parts with the new ones we had ordered, but there are still more needed. He marked all the pieces with a silver marker so we could keep track of what we will need to order. It is looking much better and he was able to put in a few of the panes. Before long it will be as good as new and I think we may not need the roll of silver duct tape after all. We brought the lawn mower out of storage and gave the grass a trim taking just “a little off the top”. PHF is beginning to shed its winter robes and is stepping into the festive colors of Spring. One of the steps in that direction was to clear away the wood bins from the porch, giving it a good sweep and putting up the SWING! You heard right. My swing is back and I couldn’t be happier. I think I hear it calling me for nap. The temps today got up to eighty degrees and the sun was shining all day for a change. I actually broke a sweat while I planted the strawberry plants that we bought last weekend. 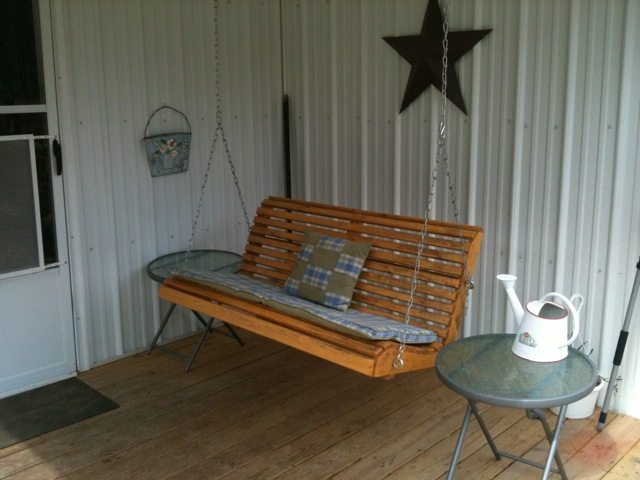 Sonny built a raised bed out of 2x6s and we decided to put it along the side of the porch. They will get full sun there. We needed to fill the bed with some dirt so we got a wheel barrow load from the garden. I had two bags of organic potting soil and we mixed that in as well. Our soil here is mostly clay and I’ve read that strawberries like a more sandy type soil. Luckily there is still some sand left from the root cellar project. The masons left it when they put the block up last year. A dab of that mixed with the rest of the soil and the strawberry plants should be happy. Of course the chickens had to inspect while I was planting the strawberries. They were just itching to get in that strawberry bed and do the chicken dance. Unfortunately for them the strawberry patch will not be a chicken disco because I put a fence around it. I fashioned a fence out of chicken wire and four fence stakes. 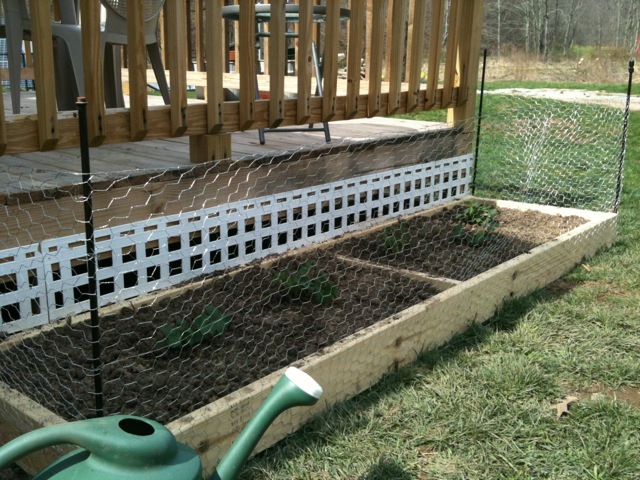 The fence stakes worked well as anchors on the four corners to keep the chicken wire from sagging. I secured the fencing material to the stakes by reusing the wire that had secured the roll of chicken wire. Then I stapled the rest of the fence to wood boards. It turned out to be pretty sturdy. It should be easy to cover the plants with a sheet if we get a freeze and I have some wedding veil material that I picked up at the flea market last year if birds try to eat the berries. With any luck strawberry shortcake will be on the desert menu. Saturday John and Carol helped us put the fencing up for the pig pen. Sonny bought some supplies but to keep costs down we have been using left over materials from other projects. 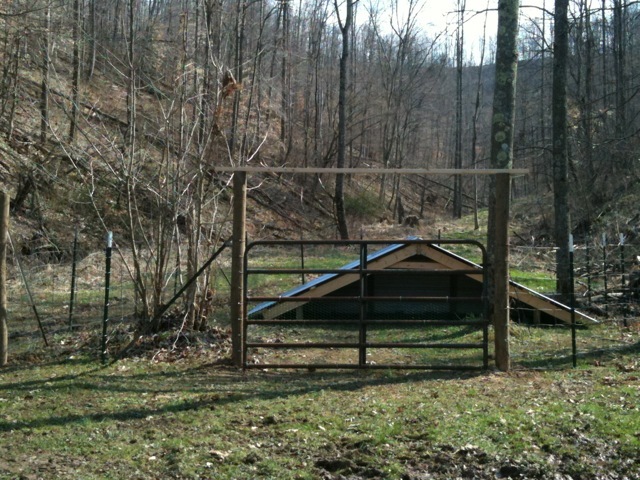 We had some cattle wire and T-posts and John had the wood posts and gate. It helps when you don’t have to go buy all new materials to a job. It took all morning to put up the fence but with everyone pitching in it was finished in no time. We still need to do a little damage control to make sure the pigs can’t root their way out, but if they do we all know whose pig it will be. Yea, thats right. Speed dial. 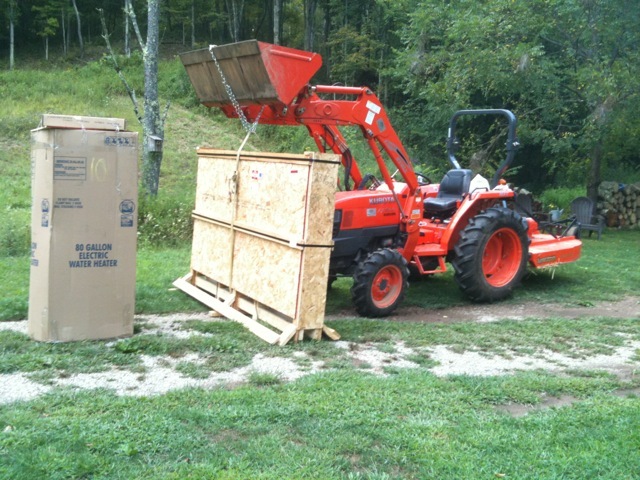 UPS delivered our RION EcoGrow Greenhouse kit the other day. 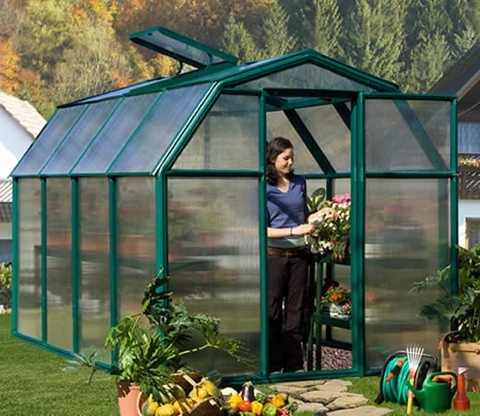 This 6×10 honey should take care of our early gardening needs with no problems. Now all we have to do is wait the snow to melt. The temperature was in the high 30’s today with the sun peaking through ever once in a while. 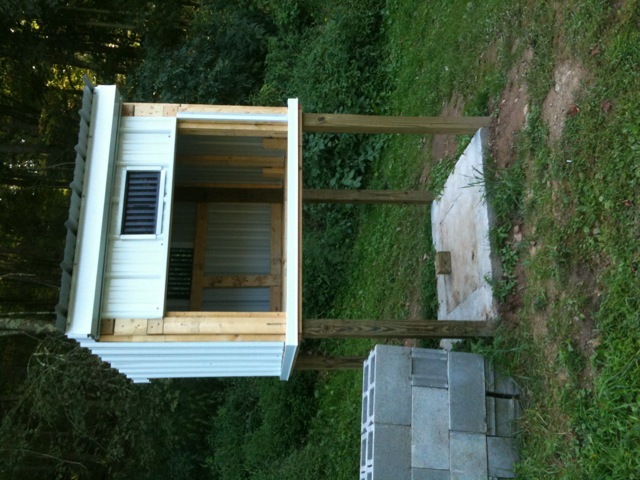 Earlier this week Linda mentioned it was time to get the chicken coop cleaned out so today was as good as any. We used the bucket on the tractor to dump the poop and straw on the garden. This should help us out when growing season starts. You are currently browsing the archives for the Solar-Powered category.